Several years ago, I decided that I had had enough. My students had spent five minutes negotiating whether or not they should play “Candyland” or “Sequence”; then five additional minutes deciding who was going to be “red”; then three minutes deciding who would be going first. I accomplished less than ten trials/data points during the entire session. I was done. D.O.N.E. I found a cabinet with closing doors, put half my games into it and gave away the other half. Although my students that year continued to beg for their favorites, by the next year the games had been mostly forgotten. Today, my students don’t even realize that I have a treasure trove of games next to my desk collecting dust. Please don’t misunderstand. I want students to like coming to speech. I hope that they will tell their parents and teachers that they enjoy speech time. But I do not want them to think that speech is just where we have fun and play games. For my articulation students that could graduate in a few years, I hope they will see graduating from speech as a great accomplishment and not a punishment. For my students that will likely be in speech for many years, I hope they think of speech as a safe learning space. For all of my students, I hope that my caring, fantastic personality* will make students feel special. In none of these scenarios is speech equivalent to a game room. *If you know me in real life, please do not let the rest of the world know the extent to which I exaggerate my character traits. Add laughter into therapy sessions. There is nothing like making students laugh to make speech enjoyable. Use ridiculous mad libs, puppets, acting, or jokes to lighten the mood while remaining true to the speech goals. Sometimes, I make my students get out of their chairs to demonstrate a new vocabulary word that we are working on, or to act out a scene for a story. Use crafts to engage speech and language. I am a big fan of crafts. They work on so many direction-following skills in addition to providing hands-on experiences. Crafts are also perfect for taking home and re-explaining the entire process again and again. Win! My lesson plans always include crafts to do with students, in addition to the plethora of crafts you can find on Pinterest (please follow me here for tons of organized pins and ideas!). Play word games. 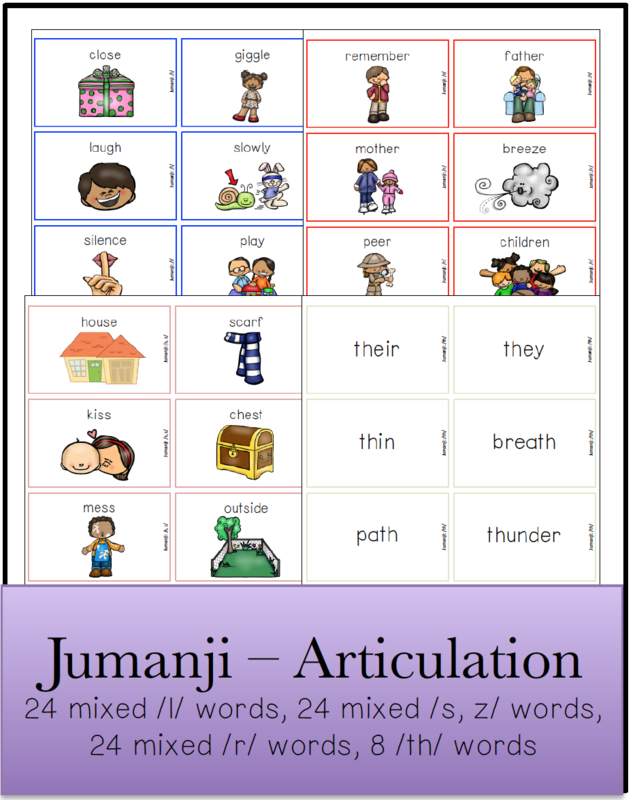 I designed my speech club curriculum to entail daily word games that also work on articulation sounds. Students enjoy these activities while still knowing that they are learning. Occasionally use simple games that take no time to set up or clean up. 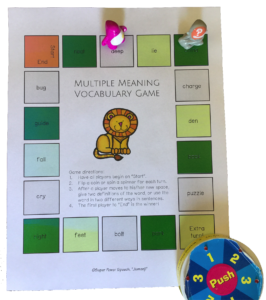 I recommend open-ended game boards that you can find free in many of my book units or on teachers pay teachers. I am a huge fan on Super Duper’s Chipper Chat for an easy, fun reinforcer. Have a party! My groups receive speech dollars for being safe, respectful, and responsible in speech. They can earn additional money by returning signed homework. When the team earns $75, they get a party. By making the party expensive, they only get one or two parties per year. But by reminding them during each session about how much money they have and what they are working towards, they are excited about that lofty goal of ice cream and popcorn (seriously… that’s all it is!). What do you think? 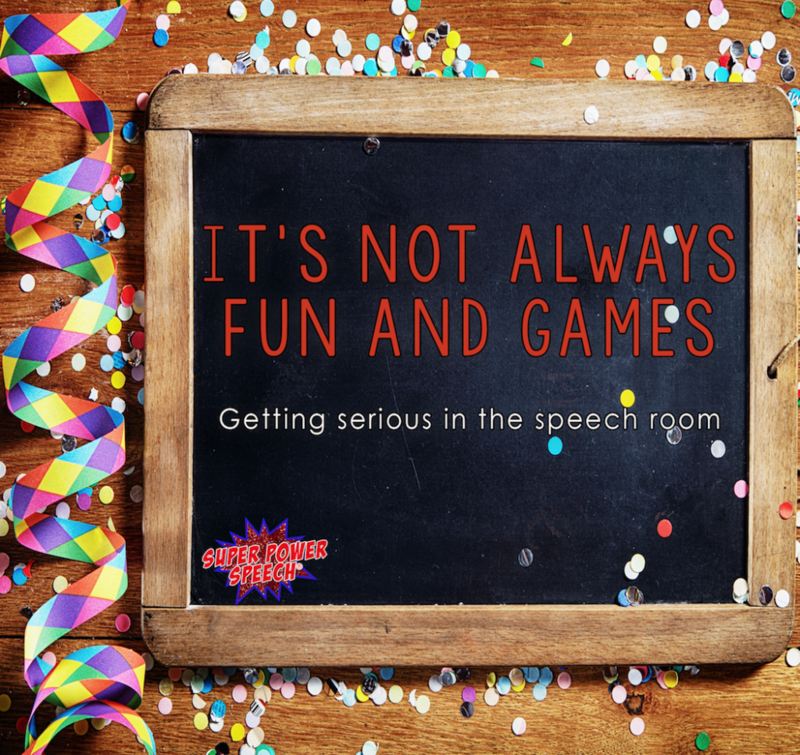 Should speech be all fun and games? Comment below. 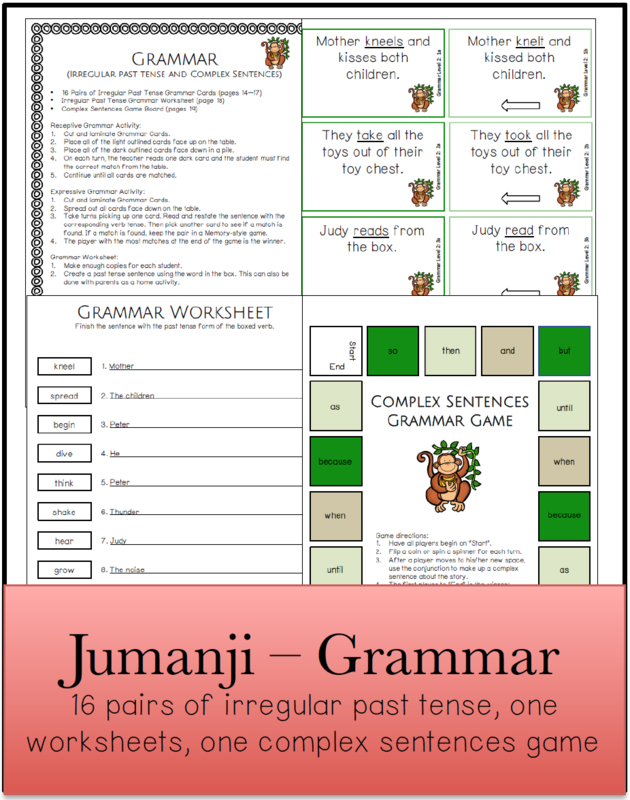 On the topic that it’s not always fun and games, I have finally put together a book unit on one of my favorite picture books (Amazon affiliate link) “Jumanji“. This classic book was made into a popular movie starring Robin Williams in 2000. In this story, the amazing author/illustrator Chris VanAllsburg tells the tale of two bored children that find a board game that literally transforms their world for the duration of its play time. You don’t want to miss either this book or the speech/language book unit that I have put together for students in second to fifth grades! Wondering why to use literature in speech therapy? Read this post. 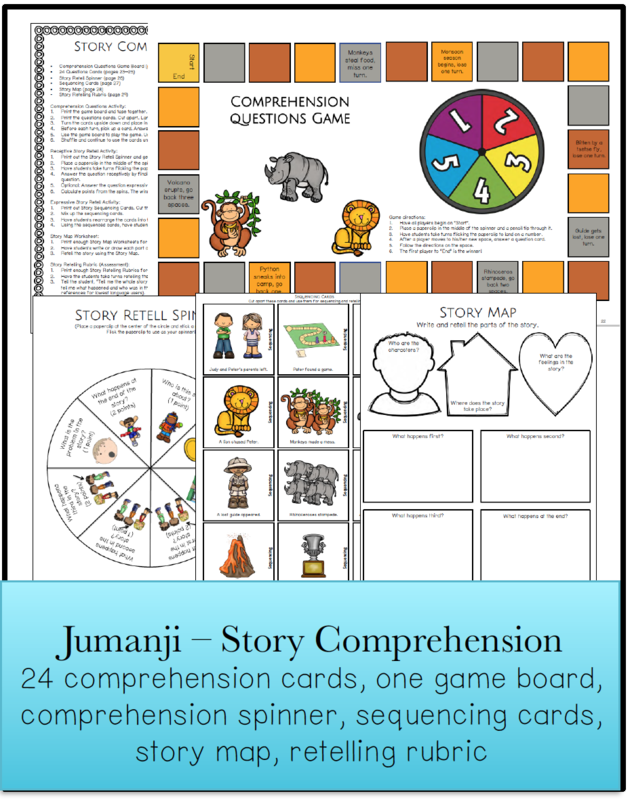 Check out all of the parts in this book companion: vocabulary, grammar, story comprehension, and articulation! 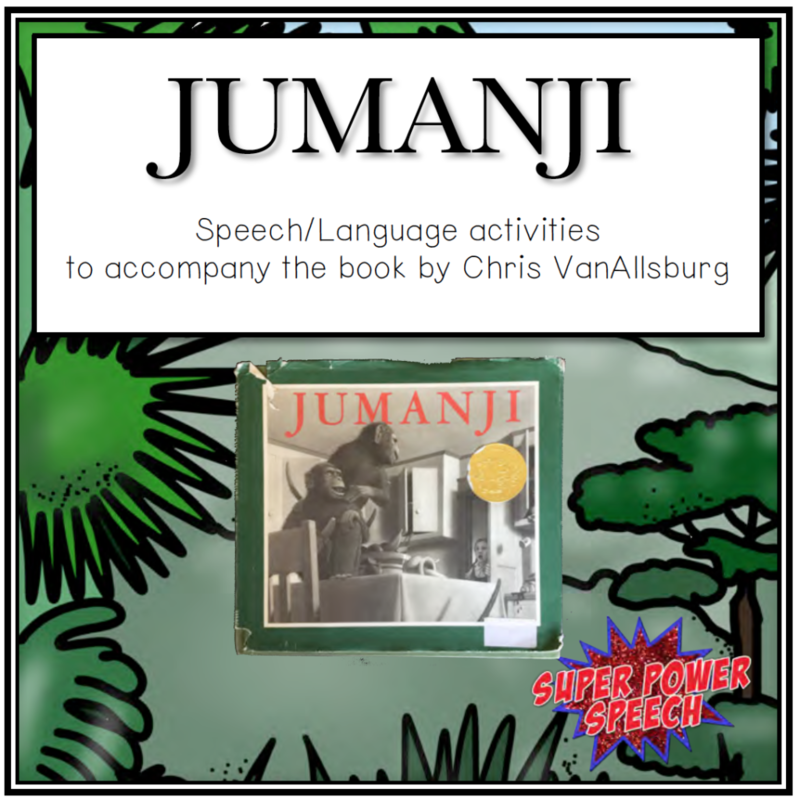 Make sure to check out the Jumanji book unit here ! I think play with a purpose and objective is great, but not just a game to play just to play. My boys don’t have enough time in their speech sessions as is. 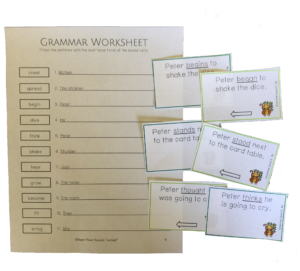 However, I have enjoyed making and playing Shout Out games to help them work on their articulation. The Shout Out games we use have 31 words with the same beginning sound — L, R or Th. Each card has sux images and each card has one and only match to every other card on the deck. We race to find and shout out our match first while working on proper articulation. It’s a fun way to get in extra practice. Plus, each round only takes a couple minutes and there’s hardly any clean up. I think love it! Yes! that sounds great if it is super quick to set up/clean up and has a clear purpose! I love this post! I rarely play games in therapy (honestly, just if I haven’t had much plan time which unfortunately happens with 110+ students). A few students still ask to play games and it drives me crazy!! (The other students remember my rule of no asking to play games). I also have a closet full of games, but unless they are strictly language content related, we don’t play them. BUT……..once per quarter as a reward for those who have great participation and attendance in speech, we pull out the games and have a game day during their TX time. The kids loooooove this and look forward to it. I disagree. I use games in most sessions. It’s great as a reward for articulation practice. If they each can do 200 trials or improve their accuracy by 5% the group could earn a five minute game time. I use language games for verbs, describing, synonyms, antonyms, etc. 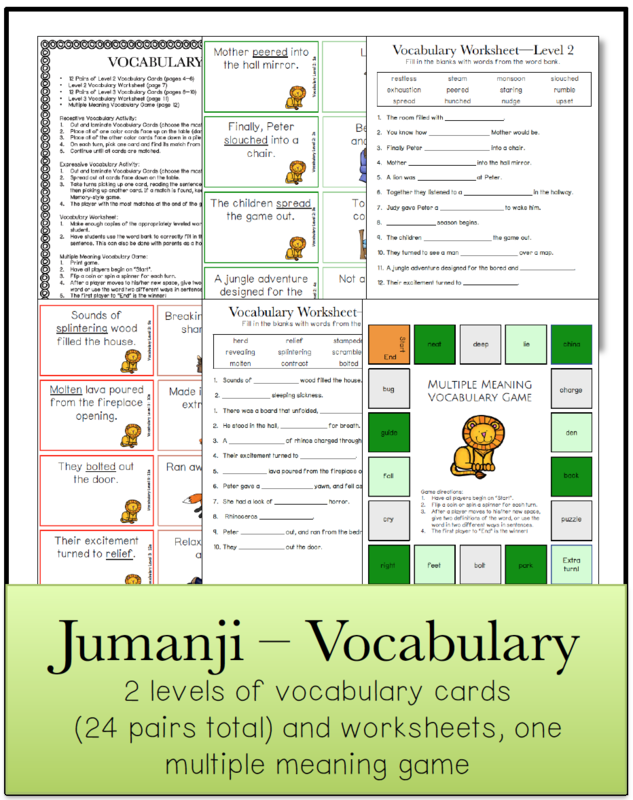 If we are reading a book, I make a game board and cards with target vocabulary, ideas, and questions. I use two iPads as a barrier game using the same building app on both. The most important reason I use games though is because at least one third of my students do not know how to play using appropriate skills. It’s great for teaching eye contact, body positioning, taking turns, and of course expected and unexpected behaviors and words for winning and losing. I’m a big fan of games if my students’ goals focus on that (such as being a good sport). I just find that there is way too much setting up/breaking down for most of my groups. I agree. I don’t like playing games and especially don’t like the expectation that we will play a game. However, I have been on a quest this year to find more activities that promote multiple repetitions while having a fun time. The students have loved the new activities and the challenge to increase productions.